There are many benefits of living with French Bulldogs – their portable size, their endearing expressions, and their quirky personalities have made them one of the most popular dog breeds in America. However, before you bring a Frenchie home, potential owners need to be aware of the problems with their tails and tail pockets. Does the French Bulldog Have a Tail? Yes, French Bulldogs sport tails. One of the most endearing qualities about French Bulldogs are their rumps, capped off with a short tail. According to the American Kennel Club (AKC), a Frenchie’s tail can be straight or corkscrew-shaped, but no matter what shape it is, it is naturally short. A short tail seems like it would be easier to keep clean and healthy than a long tail, but this is not the case. Frenchies are not all born with the same tail length. Some tails will be longer than others. Once upon a time, breeders would dock some or all of a Frenchie puppy’s tail in order to score more wins in the show ring. This practice is now frowned upon, but some breeders still partially dock tails. You may see French Bulldogs in rescues or shelters with these altered tails. What Health Issues Are Related to the French Bulldog Tail? Frenchies often have health problems with their tails and tail pockets – the little dip right below the tail and above their rectums. However, not all Frenchies have tail pockets and puppies sometimes do not get a tail pocket until they are six months old. A tail pocket is like a facial wrinkle right under the tail. Because of this quirk, the pocket cannot get cleaned as easily as other skin can. If left unchecked, this pocket can get infected. The tails themselves are often prone to genetic problems and sunburn, especially if the tails are white. Just like people, dogs love the sun but sometimes stay out too long and get burned. 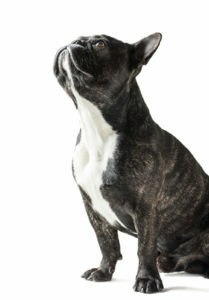 Frenchies with screw tails are often prone to a genetic condition called hemi-vertebrae. In order to create that cute short tail, the vertebrae of the spine are pressed together more closely than in dogs with normal tails. Hemi-vertebrae can cause problems walking, limb paralysis and incontinence – most commonly at an older age. It’s a very serious condition. How Do You Treat These Health Issues? Hemi-vertebrae is a condition that only a veterinarian can treat. Often surgery is the only way to make any lasting help for the most serious conditions. Rest and anti-inflammatory painkillers can help in less severe cases. It can only be prevented by not breeding dogs known to have the condition. Treating an infected tail pocket also requires the help of a vet. Symptoms of an infected tail pocket include swelling, oozing a pus-like material and sometimes a bad smell. The skin gets very itchy, so your Frenchie may be scooting or scratching his rear end more often than usual. The infection is caused by dirt, droppings, and bacteria that have not been cleaned out from the tail pocket. This can be a painful and life-threatening condition, so get your Frenchie to the vet right away for a thorough removal of the infection and a course of antibiotics. In extreme cases, surgery is necessary. How Do You Maintain a French Bulldog’s Tail to Avoid These Health Issues? The bad news is that hemi-vertebrae is not preventable. The good news is that both sunburn and tail pocket infections are. Sunburn is the easier of the two to prevent. Avoid letting your Frenchie outside during the time when the sun’s rays are strongest – from 10 am to 2 pm. Or use children’s sunscreen with an SPF of 30. Sunscreen containing zinc oxide also can help. If you are unsure about what sunscreen to use on your Frenchie, please contact your vet before putting any cream on your dog. Tail pockets need cleaning and drying to keep the skin clean, dry and infection-free. Use the mildest baby wipes you can find to clean the pocket and then use a clean cloth to dry. At first, you may need your vet to show you what to do. The small Frenchie tail can cause big problems. Those with corkscrew-shaped tails are prone to hemi-vertebrae, a painful condition which can cause paralysis. Tails of white Frenchies are particularly prone to sunburn but this can be easily prevented through sunscreen and keeping your Frenchie indoors during the hottest parts of the day. Most, but not all, Frenchies over the age of six months have tail pockets, which is like a facial wrinkle under the tail. Because of the wrinkle, bacteria can get trapped and can cause a sore, itchy and potentially life-threatening infection. This can be prevented by cleaning the tail pocket every day with baby wipes and drying it with a soft, clean cloth. This may seem like a lot of work, but soon you and your dog will get into the routine of using sunscreen and getting the tail pocket cleaned. Frenchies are worth the extra effort!